Where is PowerShell in SQL Server? In older SQL Server versions, PowerShell was installed by default with SSMS. Now it is a separated feature. No SQL Server cmdlets found on this computer. Start PowerShell without SQL Server cmdlets? In the SSMS 17, you need to install the PowerShell module for SQL Server if you want to use it. It is a module installed separately because It is easier to update and maintain separated modules than a huge package. The last package is downloaded from the PowerShell Gallery, that you can get from here. “SqlServer” is the name of the module and Get-Module is used to get information about the module. Find-Module -Name "sqlserver" -Repository "PSGallery" | Save-Module -Path "C:\mysqlservermodule\"
If you do not know what MDX, DMX, XMLA and DAX is, we will give you a brief explanation. SQL Server comes with Analysis Services, which is a database created to generate reports in a faster database designed to generate reports quickly (an Online Analytical Process Database). The design, technology and aggregation was made to generate business information quickly and efficiently. MDX was created to query multidimensional databases. DMX is used to work and query Data Mining projects. Data Mining is used to predict the future based on Multidimensional information or other sources like relational databases. It used DMX for queries. XMLA is used for Data Definition Language (DDL) actions like creating an object (cube, dimensions), deleting, modifying or processing information (load data or load the structure). DAX was introduced in Tabular Models. Many users complained that Multidimensional Databases were harder to understand and create. That is why Tabular Models appeared. They are more compatible with Excel and they use the DAX language. DAX is a simpler language easier than MDX and it looks like Excel functions. Now DAX can be used in Tabular and Multidimensional models and the language is becoming more popular. In earlier versions, you could run DAX queries in MDX interfaces, but they looked like hidden features. They were documented, but it was not obvious that the MDX script supported DAX. This was because DAX is newer than MDX. 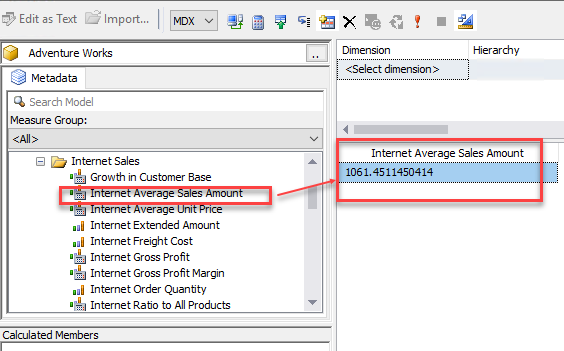 We will do a small demo about DAX in a Multidimensional Database using the new DAX options. For this demo, you can download the Adventure Works DW 2014 Full Database Backup.zip backup and the Adventure Works Multidimensional Model SQL 2014 Full Database Backups.zip. You need to restore the Adventure Works DW in the Database Engine and restore the multidimensional model. You can run a DAX query. In this example, we will run the Evaluate function. At the time of this writing, you cannot visually create DAX queries by Dragging and dropping measures and dimensions like you do in MDX. In this article, we showed how to download PowerShell for SQL Server to be incorporated with SSMS. We show some useful PowerShell cmdlets to get the last version of the SQL Server PowerShell module and how to download the module to a local path. In the second part, we learned about the new DAX buttons and options. We ran some DAX queries in a multidimensional database.